Are We on the Eve of Total Life Extinction? The US is pushing toward war with Russia, which could mean WWIII -- and the end of all life on planet Earth. Are we on the eve of total life extinction? It may not be by natural weather conditions or environmental contamination, but by human madness. In October 2015, Foreign Policy Journal published my article “The Unknown Danger of Nuclear Apocalypse“. The major point from my analysis of the first few seconds of nuclear tests in the atmosphere, as well as some effects on the Sun, led me to the following scary conclusion: In the case of simultaneous (within a minute) powerful nuclear explosions in the atmosphere, a part of the atmosphere could be sucked into space due to one or more powerful tornadoes that extend to the upper atmosphere and space. Such a fateful event, of course, cannot be tested in the Earth environment, but supporting evidence comes from the fate of our neighboring planet Mars. It has been known for many years that Mars once had liquid water in rivers and even an ocean, and so it had an atmosphere. Recent analysis of scientific data indicates that the Martian atmosphere once contained oxygen. Now, however, it is a dead planet. In the article “Evidence for Large, Anomalous Nuclear Explosions on Mars in the Past“, presented at the 46th Lunar and Planetary Science Conference (2015) organized by NASA, Dr. John Brandenburg presented solid scientific arguments about a fateful planetary event on Mars that wiped out its atmosphere in a very distant past. The skeptics, who may claim that this is speculation, may feel comfortable believing that a similar effect could not happen on our planet. I would suggest that they look at the scientific evidence and weigh the arguments. Isn’t the fate of Mars a good lesson for our civilization at the present time? Presently we are at the stage of a very dangerous confrontation between the nuclear superpowers, and most of the rhetoric comes from the present US administration and its NATO allies against Russia. In the campaign at the American Legion National Conference in Cincinnati, Ohio on 31 August, Hillary Clinton said: “As President, I will make it clear that the United States will treat cyberattacks just like any other attack. We will be ready with serious political, economic, and military responses,” How will she be sure that the cyberattack is organized by Russia or some other government? It is known that hackers could work from anywhere, without borders or government coordination. On September 12, 2011, at a Republican presidential debate, Representative Ron Paul disclosed, “We’re in 130 countries. We have 900 bases around the world”. Presently NATO has additional bases in east Europe and Baltic countries. Russia on the other hand has two foreign bases in Syria and Vietnam, and another six bases in neighboring countries that were part of the former Soviet Union. On October 3, 2016, the Obama administration suspended talks with Russia on ending war in Syria. The reason was the Russian military support of the Syrian president Bashar al-Assad, who actually invited Russia to join the fight against ISIS. On the same day, the army Chief of Staff General Mark Milley warned: “The US military, despite all our challenges, will stop you, and we will beat you harder than you have ever been beaten before”. How could Russia not feel threatened by such rhetoric in Washington? On October 4, 2016, Russian President Vladimir Putin announced the suspension of an agreement between the US and Russia signed in 2000 to supply the US with plutonium. The relations between the US and Russia deteriorate with each passing day. Feeling encircled by the new NATO military bases in East Europe, Russians, whose memories of WWII on their territory are vivid, now fear the onset of WWIII. The Russian president clearly warned that nuclear war is imminent, while continuing to say that Russia does not plan to invade any country. Starting on October 4, the Russian government organized a 4-day, large-scale, all-Russian civil defense drill. It claimed that more than 40 million people would be involved, including 200,000 emergency services personnel and soldiers and 50,000 units of equipment. This drill was at a level unprecedented even for the time of the Cold War. 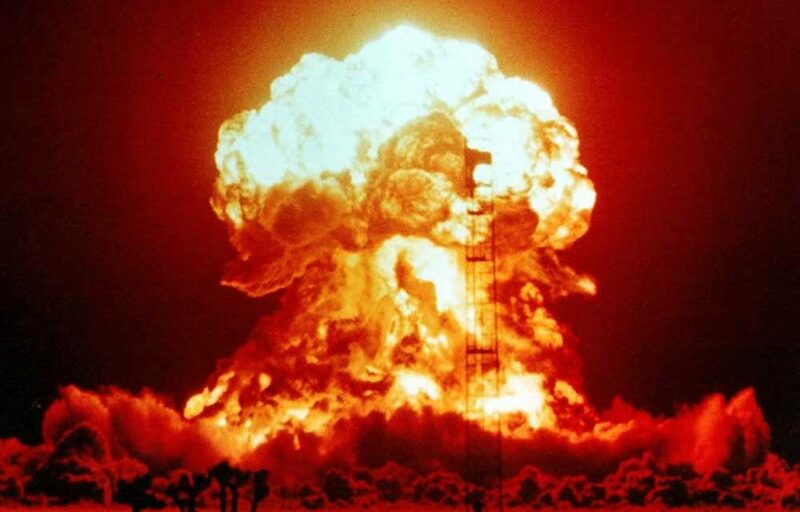 One logical question arises: Could a global nuclear war between the superpowers be triggered by some unpredicted event? My answer is: Yes. At the time of the Cold War, the nuclear military response was not as automated as in the present days of technological advance. The US also did not have bases at the border of the former Soviet Union. There was about a 30 minute gap in which the top commander-in-chiefs of USA and Soviet Union could communicate urgently to stop a massive nuclear strike. This 30 minute gap no longer exists. Recently, the UN raised an initiative to start negotiations on a treaty to ban nuclear weapons, but major nuclear powers like the United States, Russia, Israel, France, the United Kingdom, and Australia are opposed. This initiative might have been workable two decades ago, but now it is ill-conceived. This could not happen in the present atmosphere of mistrust. In the past, nuclear warheads were mounted on ballistic missiles and big rockets, but now they can be carried by smaller tactical missiles. How could Russia, for example, trust that the bases surrounding its border would not have tactical missiles able to carry nuclear weapons? Russia will feel vulnerable, because it does not have bases surrounding USA borders. I don’t intend to judge the politics between the superpowers, who is right and who is wrong. My point is that the politicians are not informed about the real danger from a nuclear apocalypse. They live with the belief that they and their descendents will survive a nuclear war, while ordinary people are not considered. The scientific evidence from Mars indicates that nuclear explosions can extinguish all life on Earth, including their own. I would remind those who believe that WWIII is not possible that ordinary people on the eve of WWI and WWII also did not believe that such a war could happen.